The Hope College Great Performance Series will feature the Rastrelli Cello Quartet on Friday, Jan. 23, at 7:30 p.m. in Dimnent Memorial Chapel. Kira Kraftzoff (founder and artistic director), Kirill Timofeev, Misha Degtjareff and Sergio Drabkin formed the ensemble with a mission to perform music “between the genres,” and their widely varied programs mix comfortably works by Johann Sebastian Bach, Camille Saint-Saens and Peter Ilyich Tchaikovsky with those of George Gershwin, Dave Brubeck and Leroy Anderson. The name of the quartet is taken from the 18th-century architect Bartholomew Rastrelli, who designed the Hermitage in St. Petersburg, the home city of three of the four Quartet members. 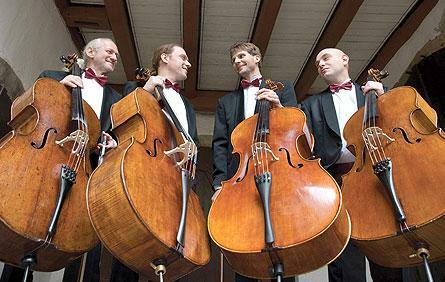 The Rastrelli Cello Quartet has performed in many of Europe’s great concert halls, including the Gasteig in Munich, Konzerthaus Vienna, Concertgebouw Amsterdam, St. Petersburg’s Philharmonic Hall, Bulgaria Hall Sofia, the Liederhalle Stuttgart, Leiszhall Hamburg und Mariinsky Theater St. Petersburg. In addition to conducting concert tours in Europe, the United States and Russia, the quartet performs at summer music festivals such as the Beethoven Festival Bonn, Schleswig-Holstein Music Festival, Darmstadter Festspiele, Branderburgische Sommerkonzerte, Oberstdorfer Musiksommer, Hohenlohe Kultursommer, Rheingau Musikfestival, Ohridsko Leto (Macedonia) and the Meadowlark Music Festival USA, and has cooperated with Giora Feidman, David Geringas and Gilles Apap. The quartet currently has five recordings (Rastrelli, Volumes 1-5) on the Solo Musica, TonArt and Manchester labels, as well as a 2008 release with music by Piazzolla titled “Cello in Buenos-Aires.” In 2009, the Rastrelli Cello Quartet’s CD “Cello in Classic” was nominated for a Russian Grammy and was given a second-prize award. Individual tickets are $18 for regular admission, $13 for senior citizens, and $6 for children 18 and under. Tickets are available online at hope.edu/tickets as well as at the ticket office in the Events and Conferences Office located downtown in the Anderson-Werkman Financial Center (100 E. Eighth St.). The ticket office is open weekdays from 10 a.m. to 5 p.m. and can be called at (616) 395-7890. Dawn of Midi will perform at Hope College on Thursday, Jan. 29, at 7:30 p.m. in Wichers Auditorium of Nykerk Hall of Music.